I had lost hope there was ever going to be another film that would ever make me the feel the way this made me feel. I was not prepared. GUARDIANS OF THE GALAXY (GOTG) provided an impenetrable sense of immersed escapism that was almost transcendent, I wasn’t a viewer, I was a participant. My inner child, the one who was taken to a galaxy far, far away many moons ago was being fed the primordial building blocks that birthed a life spanning, debilitating cinematic obsession. Don’t get me wrong, I am pulled in completely by other movies, DAWN OF THE PLANET OF THE APES most recently, but this was different. This filled me with childlike wonder in a way that stripped away all cynicism of “feel good” judgmental shallowness and let me bask in an explosion of intergalactic imagination. GOTG is a touchstone film. Comparing it to other Marvel films is redundant; it goes far beyond those mere earthly limitations. As a comic book film, as a sci-fi adventure, a space-opera, as fantastical big-budget popular entertainment GOTG resets the bar. Where to begin…It shouldn’t fraking work! The whole thing just should not work, but it does. Talking raccoons, walking trees with a vocabulary limited to “I am Groot”, relentless shifts in tone, tender emotion one second, hilarious and farcically absurd the next. If there is a 5th wall it breaks it. Holy frak, there is even Kevin Bacon jokes in space, 70’s pop, bubblegum hits and, did I mention the rodent wields a machine gun and is the only truly capable member of the outcast team? The ultimate culmination of the silver screen zeitgeist of our time and those of days past, there is an aloofness, a seemingly effortless amalgamation of color, comedy, character, cosmic vision and assured Direction that adds up to motion picture magic. This is off beat spectacle with a heart beating the lifeblood of kitsch beauty. It’s an ebullient mix of graphic and audio influences paced to the nanosecond, just surrender to its full scope of sensory wonder and enjoy the ride. Right from the opening shot as 10cc’s soft rock ballad I’m Not in Love echoes through the Milky-Way, the off kilter camera slowly rotates its view of Earth from the reaches of outer space, disorientating. Unbalancing, Director James Gunn immediately forcing his need for us to hand over control of the experience, the song hypnotically soothing as reality slips away. By the time the bopping, gliding Redbone accompanied opening credits cement the beat of its own drum tone you should already be putty in the filmmaker’s palm. 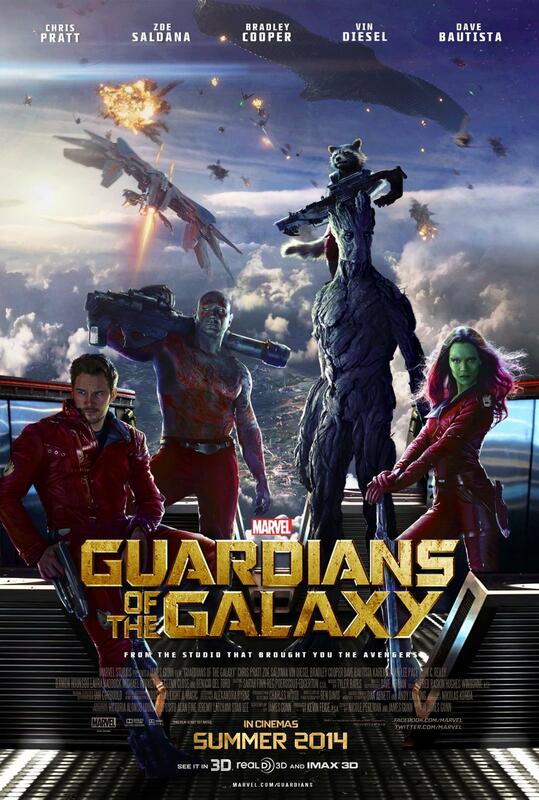 Avoiding major plot points Peter Quill (Chris Pratt) is the Star-Lord, a troubled earthling abducted by Aliens. Now 26 years later he’s a goofy, small time scoundrel who inadvertently steals an item of unimaginable power and will be hunted to the death for it. 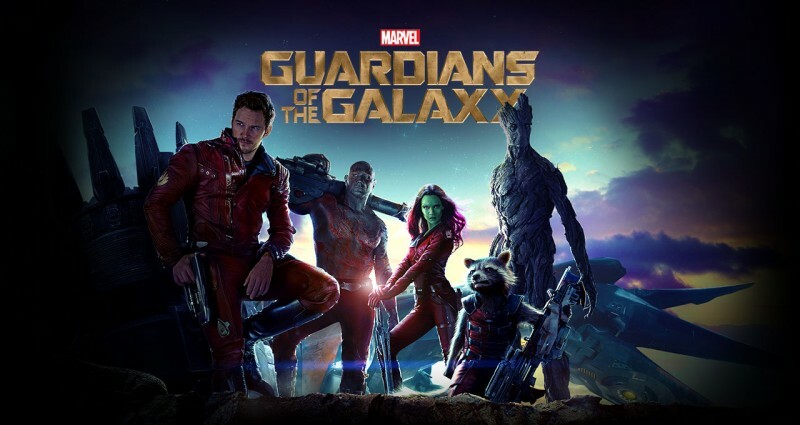 Desperate circumstances conspire and Quill ends up uniting the band of adversarial extraterrestrial oddballs that come to be known as the GUARDIANS OF THE GALAXY. Far from heroes, questionable in their ability to even get along without killing each other, let alone save the galaxy, these misfit losers fight for their lives while also beginning to find purpose and understand its value. These characters are not archetypes and the acutely self aware screenplay by Gunn and first timer Nicole Perlman is something to behold. The way it mathematically balances laughs with thrills, plot with character all the while adhering to its own wildly eccentric internal logic and the larger Marvel multiverse lore is as impressive as the eye popping designs, (the vehicles, architecture, landscapes and general aesthetic appearance display meticulous splendor) technical artistry and showboat performances. Pratt’s doofus Han Solo injects the Shatneresque naturalism that charms at the center of the film. As the lethal Gamora Zoe Saldena (The Losers) brings a stoic strength and undeniable sensuality that never seems false. Dave Bautista’s (Riddick) Drax the Destroyer is far more than just a hulking smash machine and he brings a soft footed tenderness from page to screen. All Thanos’ sinister villainy is onscreen through the eyes of Josh Brolin’s face of stone. ‘Liberace in space” is how Benicio Del Toro described his enigmatic Collector, and I’m not going to disagree. There is a flamboyancy to his manner under which lurks an uneasy morality reveled through the stroke of a finger or the raising of the head. No less real, versatile or pivotal the animation team and their voice actors have rendered artificial constructs with unquestionable humanity and distinct personality. The scene stealing, tech savvy, genetically engineered raccoon named Rocket is voiced with a Gilbert Godfried by way of Joe Pesci enthusiasm from Bradley Cooper (A PLACE BEYOND THE PINES). While the true innocent of the group, the gentle soul that happens to be in the form of a sentient tree named Groot is voiced by Vin Diesel with the same vulnerable compassion he bought to IRON GIANT, albeit in a softer octave for much of the time. Everything IMAX 3D was invented for, every frame a live action comic-book panel bought to life. GOTG oozes schlock artistry wrapped in real world emotion, its solitary obsessive goal giving the audience a good time. Daring, exceptional filmmaking that….why am I even bothering to pretend to be objective, I can’t. This film affected me very, very personally. 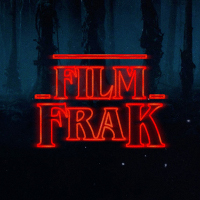 It reeducated me, showed me that the most powerful cinema experiences are possible without any deeper purpose or meaning. The gargantuan joy of going on this kooky adventure made the transition back to reality akin to having my childhood ripped before my very eyes as the curtain closed. I wept, I was dazed, I trembled, adult life took some readjustment. You have been warned. 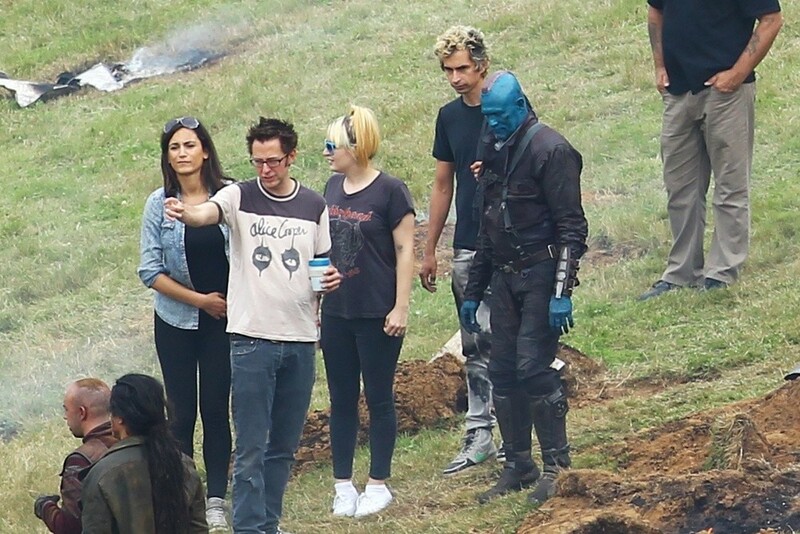 James Gunn talkin’ ’bout doin’ his thing.